So on the way to work this morning I ran across 2 signs that just puzzled me greatly. Since I do not carry a digital camera with me at all times, and since it is not really all that wise to snap off pictures whilst driving, I do not have any photo evidence as proof of these 2 signs, but I will do my best to relay them to you. Sign 1: This sign was in the alley that runs behind my house. It was a sign made from a card board side of a box with its message written in ball point pen. 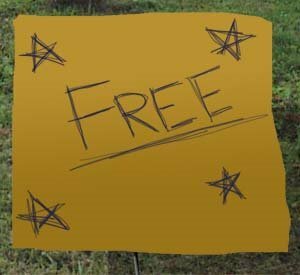 The sign reads “Free” and is decorated by some stars. The text of the sign is made legible by the repeated scratching of the letters and stars over themselves until readable by a passing car. Nope, no markers are being used for this sign. Anyway, the issue is not so much with the construction of the sign as much as it is for the pile of crap that the sign was referring to. The sign was referring to a pile of trash that was waiting to be picked up on this coming Friday (our current trash pick-up day). It was trash that the previous owners felt that someone might want. Thank you very much, but I do not want your discarded pizza boxes and/or empty 40’s. Sign 2: This sign was again on the remnants of a large card board box that had been heedlessly torn and stapled onto a telephone pole. 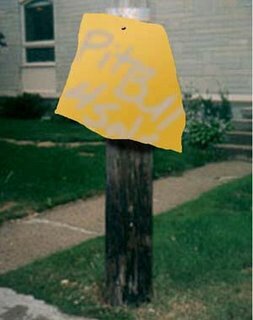 The cardboard was that light yellow colored cardboard and the crappily penned message of “PitBull 4 sale” sprayed on in light gray spray paint. Quite eloquent in its simplicity, really. It is a straightforward message with no areas to question. There is a pit-bull terrier for sale somewhere within this area. There was no contact information associated with this hastily scrawled advertisement, so if one were in the market for a pit-bull one would find this piece of cardboard really more taunting than helpful. This advertisement does bring up some other questions. Torn cardboard with poorly written sales pitches using light gray spray-paint without any contact information does not a registered breeder make.